Did you enjoy this year's Question Time event but wish you could have been more involved in the debate? Well now's your chance to share your viewpoints on the topics discussed at the event in October. Your chance to continue the debate. 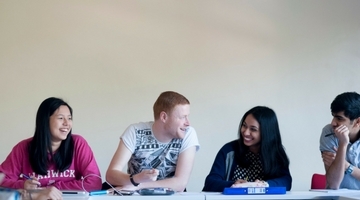 The Department of Economics hosted its first Question Time event on campus in September 2013, providing University of Warwick students and staff with the opportunity to engage with politicians, policy makers and academics. It was a huge success, with many demands made for follow-up events. Students' Question Time is now also an annual feature in the Department's diary and allows students to debate on some of the topics raised from the Question Time event, which this year took place in October 2016. The 2017 event will take place on Monday 16th January 2017, 6.15-7.45pm in MS.01 (Maths & Statistics). As with this year's main Question Time event, we are collaborating with the Department of Politics and International Studies (PAIS) to put on this event. For Economics first years attendance at this event will count as 10 credits towards your Personal Development Module.